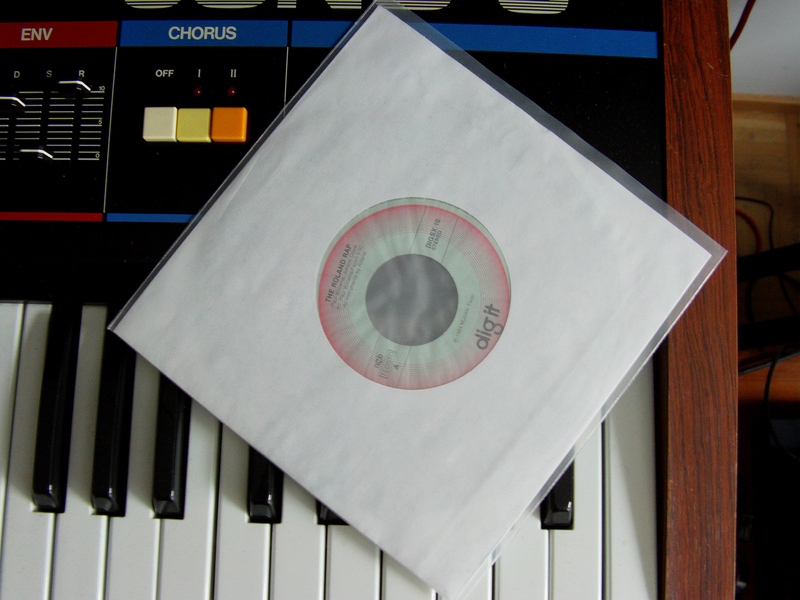 A rare 7" on top of it's inspiration. As a synth collecting record collector I’m always happy to find 7″ singles with synths on the cover or similar stuff but this is even better. Years ago I found this mysterious single from a second hand record shop for a couple of euros. With no mention of the performer the single only has the track’s title “The Roland Rap” with writer credits on it’s label and the texts “All instruments by Roland & Musiikki Fazer 1984”. Instantly when I saw the title I wondered if it could be a Finnish advertisement jingle for Roland synths. And that’s exactly what it was. A cheesy soft electro track goes on for well over a minute but then the long wait is rewarded. As the lyrics go on about the benefits of midi and the amazing sounds of Juno- 106, you can’t help but wonder, who was this track made for and why? Soft spoken vocalist rambles on and on about Roland’s 1984 synth and music gear line-up but the real treat comes at 1:53 when he tell’s about Roland’s new guitar synth. “Try the guitar synth, play a note and see, it will blow you off, just wait and see.” Hahahah! Personally, I’ve never owned a guitar synth and am not aware of their sexual abilities, but that claim seems just a little bit exaggerated. None of my synths have unfortunately ever blown me off. The chorus is just pure amazingness. A high pitched voice singing “Roland! We design the future!” All in all, surely the best synth advertisement I’ve ever heard. Made in Finland. P.S. Don’t forget today’s Synth meeting at 17 in Bar Kuka. Great job putting this up online!!! Hmm, I think one particular Sami Sarhamaa would be able to answer a few questions concerning the origins of this track. Also, Mr. Frank Robson was one of Pro-Center’s (part of F-Group and Fazer Musiikki) key persons for a long time and could be used as an information source as well. I think both fellas are easily found if needed. Great thing to have finnish OG synth guys like you commenting on this post. From the little info I myself have been able to gather, the vocalist on The Roland Rap is a certain Paul Williams who sometimes also sang in Björninen Band. And apparently the band’s line-up on this 7″ is also very close to the Björninen Band recordings. I’ve been lucky to get to hear some other stuff with Paul on vocals too and those songs had a very similar “soft-electro” -feeling to this Roland jingle. Tän teidän sivun feedillä ei ole titleä lainkaan, olisi kiva jos sen sinne joku laittaisi. Nyt näkyy vakiona RSS-lukijassa vain ‘(title unknown)’. Oiskohan nyt kunnossa tuon feedin otsikko… Kiitos!